Smarty's school had its first middle school dance of the year last Friday, and, to my relief, my tiny and young middle schooler had a blast. 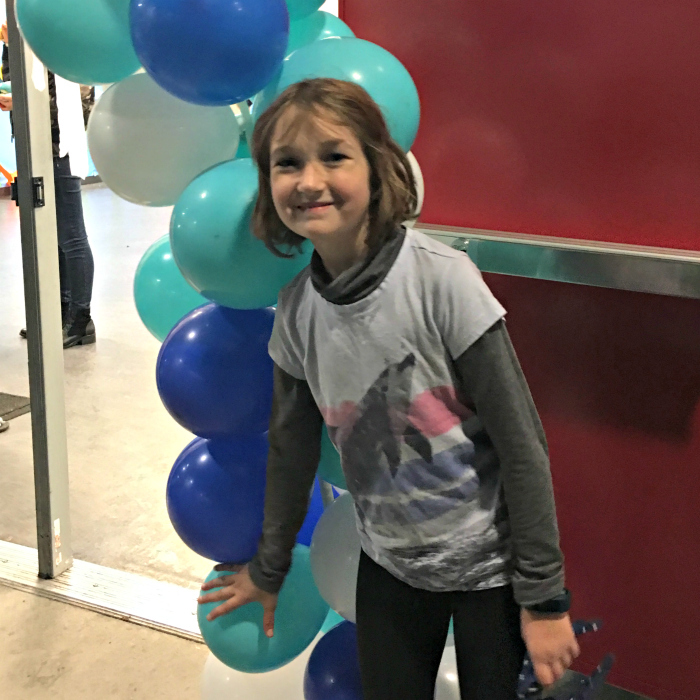 The dance was organized by the Leadership elective which has a mix of students in grades 6-8, and the topic was Under the Sea. We were sent a release form with some instructions including a definition of "freak dancing" which was not allowed. It amused me that "dancing front to front" was outlawed as "freak dancing". Basically, the only dance styles allowed were group dances. Not that it mattered anyway, because middle schoolers in Smarty's school are still in that awkward phase when they are afraid to touch each other... unless they are wrestling or playing tag or other active game. Also, suggested dress code was "casual", which explains why Smarty is wearing what she is wearing (initially, she wanted to come in a dress). Leadership team set the ticket price to be $3 - mostly to cover materials used in decorations and props for the photo booth. Parents donated food and drinks, and middle school teachers helped with music set up. The dance started at 6:30 pm and was wrapped up at 9:00 pm on Friday night. At first, Smarty was not entirely sure that she wanted to attend the dance - she did not like the fact that she had to spend her own allowance to attend. Eventually, however, she decided to go, and we agreed that she would call us from the office if she wanted to come home early. However, this did not happen. When I came to pick her and the other two kids from our street up, they did not want to go home. Smarty was happily chasing soap bubbles with her friend and was quite hyped up on sugar and excitement of the evening. Since Smarty is so young, both physically and emotionally, I often worry about her ability to enjoy the social events of middle school. But... sometimes her immaturity is actually beneficial to her. She has no interest yet in "shipping" (this is middle school slang for being in a relationship), and she just wants to have fun and play. Luckily, many boys are actually on the same page in terms of what they want from these social events, and therefore Smarty can most often be found in the company of several boys who she calls her "male friends". They all run around playing with balls and chasing bubbles, enjoying the last moments of their carefree childhood before the turbulence of puberty hits them. I am glad that Smarty has friends and is accepted despite her quirks. I can only hope that she will navigate the second half of middle school with the same oblivious disregard for what is "normal" for her grade and continue to make friends based on their compatibility, not on their gender. Do your kids have friends of the opposite gender? There seems to be very little room for cross-gender friendships in our area, which surprises me and makes me kind of sad. So, no, they don't really. But hopefully that will change through middle school and high school - with genuine friendships, not only romantic ones. Since K was surrounded by mostly boys while homeschooling, we're relieved she now has more friends that are girls. That is a great term: male friends. My daughter is currently in a "I don't like all boys phase," which is amusing me.